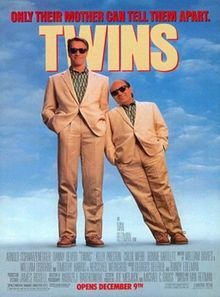 Ivan Reitman who directed the 1st film will serve only as producer on the sequel and there is no word on a director yet. Also, there is a call out for writers to handle this project. This film has the potential to be AMAZING. The first film was brilliant and adding Eddie Murphy to this project just might re-vitalize his career. Let’s all hope there are great writers and a good director hired for this project. My vote is for Devito himself to write and direct. Or get Ivan’s son Jason to helm the project. This entry was posted on Thursday, March 29th, 2012 at 10:21 pm	and is filed under Film, News. You can follow any responses to this entry through the RSS 2.0 feed. You can skip to the end and leave a response. Pinging is currently not allowed. « Charlie Kaufman is Writing A Novel!! !